DAS provides engineering services, computer programming, and program management in support of the Naval Surface Warfare Center (NSWC) in the NSWC Prototype Development Facility in Carderock, MD. Support includes integration and development of the Submarine Multi-Mission Team Trainer (SMMTT) Phase 3, the Common Operator Analysis and Employment Trainer (COAET), the Acoustic Analysis Trainer (AAT) and Sonar Tactical Decision Aid (STDA). Additional integration and development support was provided for the Submarine Tactical Decision Aid line of products and other tactical decision aids including the Common Undersea Picture and Undersea Warfare Tactical Decision Aid. DAS supports the development and deployment of submarine training products for the US Navy. These products features a revolutionary approach to teaching complex tasks involved in sensor employment. Developed at the Naval Surface Warfare Center in Carderock, MD, many projects combine three-dimensional graphics, animations, audio and scientific visualization methods to illustrate complex physical interactions, in the context of mission-relevant scenarios. From the original Interactive Multi-Sensor Analysis Trainer (IMAT) system, several programs were spun off : STDA (Sonar Tactical Decision Aid), a tactical decision aid component for submarines; STDA-SPPFS (Sonar Tactical Decision Aid - Sonar Performance Prediction Functional Segment), designed for surface combatant ships; STDA-I (Sonar Tactical Decision Aid IUSS), designed for surface IUSS ships; SET (Sonar Employment Trainer), a shore-based Sonar Trainer where the 3 dimensional tools were used to create an instructor control station; SMMTT (Submarine Multi-Mission Team Trainer, Phase 3) and COAET (Common Operational Analysis and Employment Trainer (COAET), a submarine combat control team trainer where these tools were incorporated into an instructor station. 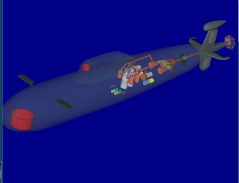 DAS is the integrator for the COAET (Common Operational Analysis and Employment Trainer), a multi-mode submarine combat control trainer. Support development and deployment of a variety of submarine and surface ship based training systems at Naval Surface Warfare Center (NSWC) Carderock Division in West Bethesda, Md.